With the July 30 elections just a few days away, perceptions on the role of soldiers in elections especially in campaigning for the ruling Zanu PF have dented the credibility of the much hyped polls, an investigation by 263Chat has revealed. Villagers in Bikita, Masvingo province and Mutoko in Mashonaland East confirmed the subtle presence of soldiers usually on leave whom they said are not directly involved in political campaigns. Typical of the much publicized ‘boys on leave’ strategy, Ernest Rambe from Bikita told 263Chat that there were three army officers from his area who were on leave and often seen in local beer-halls. “We drink with them and they openly tell us that we can campaign and work with the opposition but the status-quo will not change,” said Rambe. He added that unlike in the past when there was covert violence and intimidation, it was a different case as people were free to openly voice their displeasure against the government and Zanu PF. 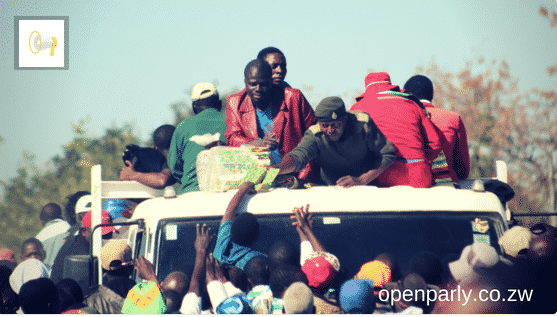 At a Zanu PF rally in Chegutu, 263Chat witnessed a soldier in uniform distributing party regalia while mixing with supporters. A Zanu PF member speaking on condition of anonymity told 263Chat that soldiers were deployed in some parts of the rural areas where they are doubling up as Command Project officers. This was confirmed by Zimbabwe Defence Forces, Overson Mugwisi who said the deployments they have in the countryside includes troops on various Command Projects. “You may want to know that the deployments we have include troops on various command projects, border control operations in support of the ZRP and in some National Parks in support of the Park Rangers,” said Mugwisi. “If some serving members are participating in the ongoing political campaigns, they will be doing so illegally and not as a result of an instruction from their commanders,” added Mugwisi. The Zanu PF source added that the manner in which the army officers work in rural areas makes it difficult to detect to give a picture of a tranquil environment as any overt process would discredit the impending polls due to the level of international attention. “Even if you spend a month in there, you may not detect it,” said the source. A teacher in Mutoko who also requested anonymity told 263Chat that army trucks were seen around their area during the days when there was so much talk about the collection of voter serial numbers from villagers by traditional leaders. “The only time there was military activity was during the days when there was so much talk about collection of voter registration serial numbers, that is when we saw army trucks that were moving around the area but it did not take long and they were off the area,” the teacher said. The military involvement in Zanu PF was also confirmed in party primary elections where a number of serving soldiers contested including Major General Tarwirei who battled it out against Tongai Mnangagwa and Douglas Mahiya to represent the ruling party in the Harare South parliamentary elections candidate. According to Zanu PF election guidelines, it takes five years as a member of the party to be cleared to contest in the party primaries. The regulations also stipulate that one has to have a position in party structures which imply that those soldiers who contested in Zanu PF primaries were in breach of the constitution which prohibits them from being members of political parties while they are still serving. A research study conducted by Zimbabwe Democracy Institute (ZDI) titled “ZANU PF/military deterrence of the village” revealed that villages are indeed militarized although reasons for militarization seem to range from attempts to assist in implementation of the government Command Agriculture programme, assisting ZANU-PF members in their campaign and maintaining peace and stability in communities. ZDI emphasized that command agriculture program is part of the menu of electoral manipulation that has given ZANU-PF a ticket to send soldiers into villages knowing that the ‘fear arousal’ impact is an unavoidable electoral benefit accrued to ZANU-PF. “This data indicates that military presence in villages is more intense in Mashonaland Central, East and West compared to Midlands and Matabeleland North. In an interview with News24, Senior researcher at Institute for Security Studies (ISS), Derek Matyszak said the Zimbabwe military has a record of meddling in politics. Simon Khaya Moyo, the Zanu PF spokesperson dismissed reports of the army working with the ruling party in its election campaigns. “Why should we (enlist the army)? Zanu PF is a mass-based party with millions of followers. What would be the point of looking for support from the military? We are capable of winning on our own,” he said. Opposition parties have often accused the ruling Zanu PF of working with the military in their election strategy, complaining that military officers had been deployed to rural areas to intimidate voters against voting for the opposition. “We are saying please stop causing our soldiers to be in the villages, stop causing our soldiers to be meddling in the civilian affairs of our politics,” said MDC Alliance Presidential candidate Nelson Chamisa. In addition, National Patriotic Front leader, Retired Brigadier Ambrose Mutinhiri told a visiting SADC observer team early this year that 2000 soldiers were deployed in rural areas prior to the Operation Restore Legacy with a further 3000 deployed after to make 5000 soldiers who are campaigning for the ruling Zanu PF ahead of the 30 July elections.